In an effort to look at continuous improvement in offering students hands on, real-world experience in the classroom, the SITC faculty brainstormed a way to better integrate the experience of the freshman ITC 110 class (Introduction to Information, Technology, and Computing) with teaching upperclassmen how to manage and mentor in a group setting. They had success in the previous ITC 110 class with upperclassmen volunteering to help manage the freshmen app groups. The goal for the fall 2017 class was to continue the mentoring experience but to bring in more upperclassmen to manage the projects and give not only the freshmen helpful and practical advice but to develop the management skills of the older students. Students share their creativity during the App Showcase. They looked to a class called IT 460 (Managing Technical Projects), a senior capstone course in which students learn organization and leadership techniques and are given an individual management assignment. This seemed like the perfect solution so the faculty decided to move forward with the idea of using these students to mentor and manage the freshmen projects. 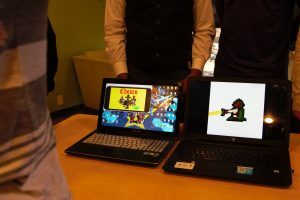 Mid semester app projects were proposed by the students within the ITC 110 class and teams were created. Each team consisted of two or three managers and six ITC 110 students (two Computer Science majors, two DET majors and two IS/IT majors). Every Tuesday, the ITC 110 class would begin with a visit from the project managers to their respective group where they would spend about 15 minutes to talk about progress of the app, goals for the week, and to answer any questions their ITC 110 team had about the process. 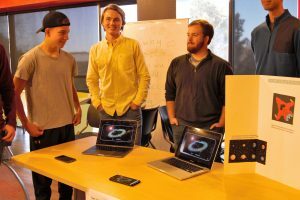 At the end of the semester, it was each team’s turn to present their app at the ITC 110 App Showcase. Click on the link below to enjoy a short video clip of Dr. Ray Pettit interviewing student app developers and managers, talking about what they learned in this unique process.